What is happening with Art Central? For the past two weeks I have had a place in Art Central. As my time draws to a close at Art Central, I think back on many memories both positive and negative. It is such a far cry from what it used to be. 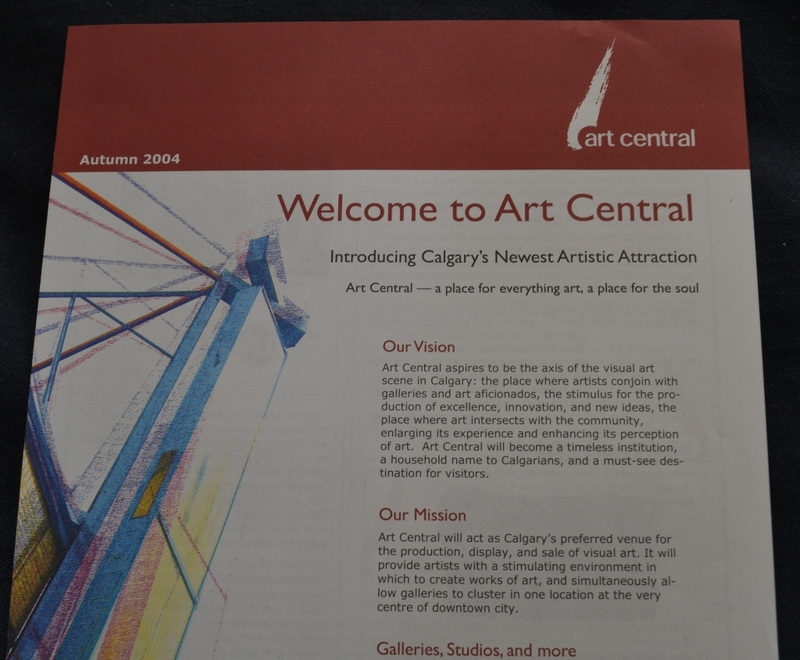 Art Central officially opened on a First Thursday in November 2004 to great hope and anticipation as you can see by the FastForward Weekly article below. Now, almost ten years later, it is trying to slink off to the corner and die a lonely death, hoping no one will notice. I remember one of the first dates that I had with a former girlfriend, it must have been around January or February 2006, we came to Art Central for a First Thursday. It was a perfect date, she had never been to a gallery before and I was very involved in galleries. There were so many people, live music, entertainment, wine and more. She loved it, and she wanted to come back again the following First Thursday with her friends. Art Central was the place to be on a First Thursday. That was back in the days when 100s of people would be out for the evening. The party started after work and it probably didn’t completely wind down until sometime after 10:00. As David Neill said when he visited a few days ago, those first three years were good years for the building. After 2008 it started its slow decline. Now it is hanging on by a thread. Soon the lights will be turned off. I have two days left in my lease – unless I am able to get an extension for a few more days to finish wrapping things up. Now I am the last standing art gallery in the building. It is surprising really. Ironic too. I would have never guessed that. If someone was to say that to me even a few months ago I would have laughed at them, shaken my head and told them there is no way this would happen. I think of all the people that have been in this building over the years. There have been a lot of interesting artists, boutiques and shops. 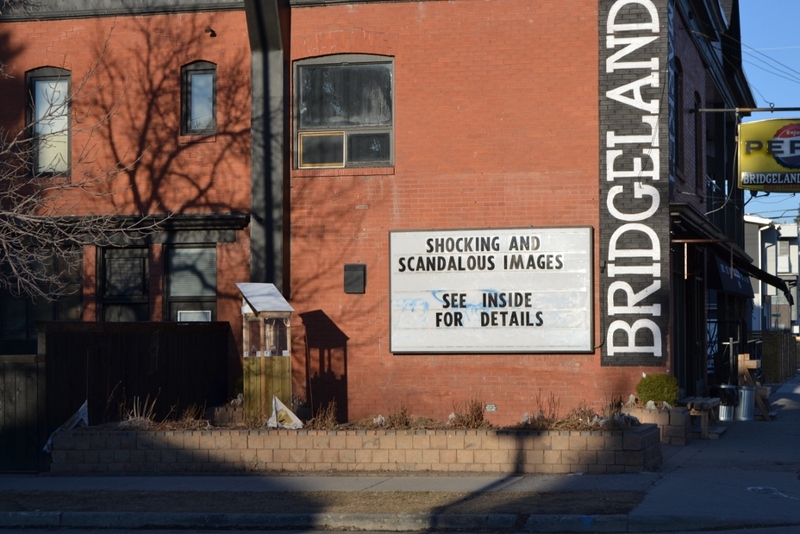 It was an incubator for creative businesses and artistic practice, often in the early stages of their development. I often wonder whatever happened to all of those who passed through and where they are now. In fact I think that it would be an interesting tribute to list all those involved and what happened to them. 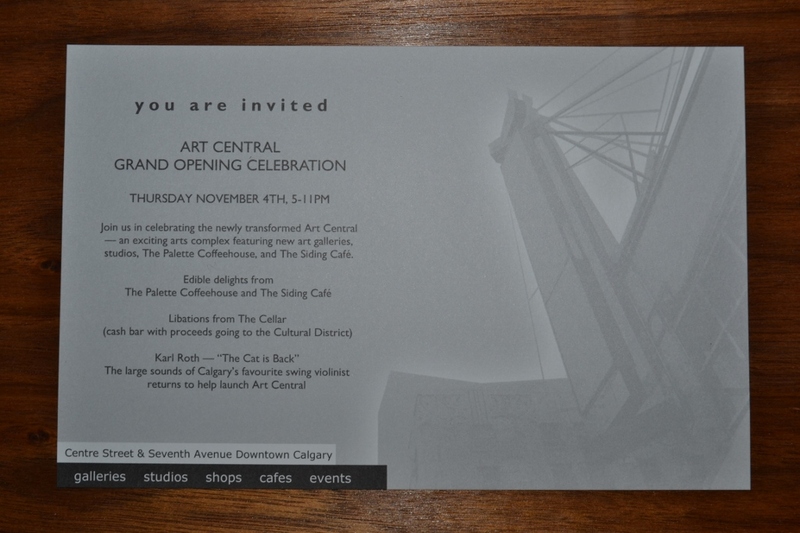 The Art Central building was a small snapshot of a certain aspect of Calgary cultural history that for the most part slipped under the radar screen for many, for whatever reason. Influx Jewellery Gallery – the four original partners transferred ownership around 2011 when the partnership could not continue. The business is still doing business with a storefront location in Inglewood. Be-Art Gallery – closed in 2007 when the owner decided to focus exclusively on her clothing boutique located on the main floor, although she still continued to display a few pieces of art in the boutique. The Palette Coffeehouse – closed around 2009, maybe 2010 and re-opened as DeVille a few months later. It is still located in the building. The Siding Café – closed around 2011 and re-opened as Colonial where it is still occupying the building. During the last two weeks that I have been in this space, every single day, people want to know what is happening. 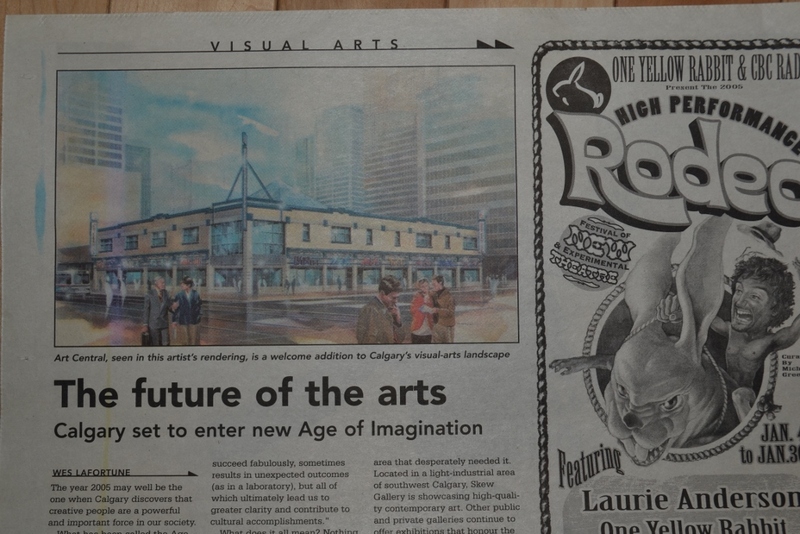 Art Central and the adjoining Colonel Walker Park are slated to be demolished, to make way for the new 58 or 59-storey Telus Sky building (there are two different numbers out there). 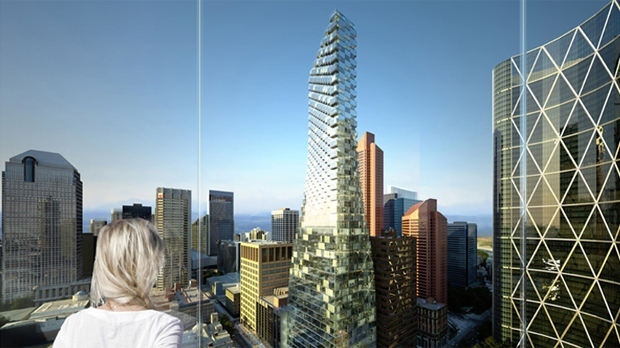 Personally I would be more inclined to believe the 59-storey number. It will be a mixed use building with retail, office and residential components. At this early stage, I think it is quite an attractive building, but I am also quite certain that others will disagree with me. An illustration of what it is supposed to look like is below. Why do so many people not know about the changes? The announcement was made at a time when many in the city were preoccupied with other things – myself included. The date – July 4, 2013 – two weeks to the day after the flood and one week, plus a day before the Stampede began. It probably got buried in the news. I am sure this is part of the main reason why. Yesterday I was talking to the security guard and it appears as if next month (May 2014) will be the final month for everyone in the building. All six tenants that remain will be leaving sometime soon. He didn’t know dates. I am sure in due course I will have more to say. Grab a beverage if you decide to read this. I warn you in advance, this will be a long one. I spent all day working on this between dealing with clients and attending a panel discussion. I want to get this out before I go to bed, so will proofread it tomorrow. Then I ended up getting interrupted all day. I have had this lithograph for quite some time now. It comes from an estate and when I got it I was quite candid in saying it would probably need to be reframed, as the plaster had been chipped off the frame in places. Quite frankly the frame looks a bit long in the tooth. This was something that they agreed with. It is an attractive piece and I accepted it on its own merits. It is in generally good condition although it does have one small place where foxing is evident in the sky. This is to be expected as the backing is not acid free. It is also not matted and is behind old glass. I received it shortly before I resigned from Image 54 and as a result, it sat in a box in my ex-girlfriend’s spare bedroom for the remaining two and a half years that we were together. When we separated, it was moved to a gallery shelf waiting in the queue to get reframed. Sadly, it was generally ignored as a result. There was always something more pressing that come through the gallery as a result of an active exhibition schedule. I finally put it up about a week ago because it is a nice piece. During that time, it has consistently attracted attention, especially from those who grew up in the Netherlands. There was a familiarity to the image that appealed to them and they would usually tell me why and leave without buying it, for whatever reason. This work is signed in pencil. I read the signature as L. Hunt. So who is L. Hunt? That is a good question. Hunt is a relatively common name. In my search to find out more about who this Hunt artist might be, I kept coming up against a blank wall. This work has two signatures. The one in pencil and the other in the plate. This is somewhat unusual, but not unheard of, especially with older works. The other signature in the plate is better known – W. Whittredge. Thomas Worthington Whittredge is an artist of significant note. He is often associated with the American art movement called the Hudson River School. The Hudson River School was a group of New York City based artists who painted landscapes actively during the period from approximately 1850 through until around 1880. This art movement was highly influential and its impact on North American art production is still felt today. Through the artists connected to the Hudson River School the early views of the vast wild, unexplored and virgin wilderness of Western North America and Niagara Falls helped define how these areas were viewed. This movement also had a significant influence in Canada. Cornelius Van Horne who was at one time the superintendent of the Chicago and Alton Railway, later became the president of Canadian Pacific Railway. Van Horne (an artist in his own right) and/or the Canadian Pacific Railway actively commissioned artists during the 1880s until around the early 1900s to paint the landscape of the Canadian Rocky Mountains. As the Hudson River School had currency with artists at that time, there is often a certain awareness of this movement in how they portrayed the opening of the Canadian Rocky Mountains and how it was viewed to audiences elsewhere. The Toronto artist Kent Monkman has recently been gaining acclaim for beautifully painted, ornately framed canvases of sublime landscapes that recall early colonial artists such as Cornelius Krieghoff and Paul Kane and the Hudson River School. Set within backdrops of majestic mountains, steep cliffs and expansive valleys are exquisitely detailed, diminutive human figures, dressed in the attire we associate with that period of history. Cowboys, Indians and soldiers appear engaged in the kinds of activities that most of us in North America were taught took place upon contact between the first settlers and Aboriginals. . .On closer scrutiny, however, it becomes clear that Monkman’s figures are engaged in encounters of an entirely different sort. After my minor deviation I must get back to Worthington Whittredge. Whittredge was born in Springfield, Ohio and lived there until he moved to nearby Cincinnati at the age of 17. In Cincinnati he worked as an apprentice house and sign painter. He then went on to operate a daguerreotype store in Indianapolis. In 1843 he decided to take up the career of an artist, came into contact with, and was influenced by the prominent American artist Thomas Cole [1801-1848] who influenced a generation of artists who became known as the Hudson River School. The year after Thomas Cole’s death, Whittredge travelled to Düsseldorf, Germany to further his studies at the Kunstakademie Düsseldorf. Thomas Hicks probably also was in Barbizon in 1849 while studying with Thomas Couture in Paris, for he displayed A Cottage in Barbison (sic) . . . in New York in 1850, perhaps the earliest exhibition of a Barbizon scene by an American artist. Worthington Whittredge of Cincinnati, on his way to Düsseldorf in 1849 stopped in Barbizon . . . but only recalled meeting Virgile Narcisse Díaz de la Peña. Getting back to the Kunstakademie, this fact is significant as the Academy had a profound effect on artists connected to the American Hudson River School. The Kunstakademie was also closely aligned with the German Romantic Movement from the early to mid-1800s. The German Romantic Movement (or German Romanticism) was rooted in the Sturm und Drang movement from the 1700s. The instructors at the Kunstakademie Düsseldorf had taken this concept further by the time Whittredge began his studies. By this time they had begun to advocate for plein air painting which had taken root in France with the Barbizon School and the artists connected to it who regularly painted the landscapes in the Forest of Fontainbleu. This Barbizon School influence (in particular plein-air painting) also played into the new Hudson River School artists. In Düsseldorf, Whittredge met Emanuel Leutze [1816-1868] and modeled for him as one of the characters in Leutze’s heroic-scaled painting that is now in the Metropolitan Museum of Art collection entitled Washington Crossing the Delaware, 1850. On this note, and a bit of a digression, another artist connected to the Nazarenes and director of the Acakemie in Düsseldorf, Wilhelm von Schadow [German, 1789-1862] also modelled for the Leutze painting in the Met collection. There is an interesting story relating to von Schadow here in the Globe and Mail from earlier this month. The Globe article primarily talks about repatriation of a painting to the Max Stern estate, but it is worth reading in this context as it relates to the discussion about the connection between the Hudson River painters and the German Romantic tradition in Düsseldorf. During his time in Düsseldorf he lived for about a year with Andreas Achenbach [German, 1815-1910] who was an influential painter connected to the school. Whittredge went on to become one of the teachers at the school and one of his students was future Hudson River (and Rocky Mountain School) painter Albert Bierstadt [1830-1902]. They obviously stayed in touch as the two of them spent the summer of 1856 sketching in Switzerland together. That fall both Whittredge and Bierstadt moved to Rome where they were joined by fellow Hudson River School artists Sanford Robinson Gifford [1883-1880] and William Stanley Haseltine [1835-1900]. From some sources it is potentially quite possible that all four of these artists travelled together as a group from Düsseldorf, spending the summer together sketching in Switzerland. They then moved together and established themselves in Rome. Please Note: This paragraph has some speculation in it and requires further research, to confirm correctness, although for our purposes it is not material to this piece. From Rome, Whittredge moved back to the USA around the same time as the others in 1859. Upon arriving in New York City he joined Gifford and Haseltine who had left Rome the year prior. All four were back together in the newly-built studio building, the first studio building in America which opened in 1858 and was conceived with visual artists in mind – 10th Street Studio Building located at 51 West 10th Street. This building was designed by the young American architect Russell Morris Hunt [1827-1895] who had just finished overseeing the major renovation of the Louvre for Napoleon III. This building housed a virtual who’s who of American artists during the time it was used as a studio building. Whittredge quickly established himself into the fabric of New York City’s artistic community. In 1860, the year after he arrived in NYC, he was elected to the National Academy of Design and two years later in 1862 he became a full member. Not only was he a member of the National Academy of Design, but he later served as the president of the National Academy between 1874 and 1877. This was an interesting period as the year after he assumed the presidency, the National Academy opened the doors to its first permanent home at the corner of 23rd Avenue and Park Avenue South in New York City. It was subsequently demolished and is now an office tower. One of the artists to study in Düsseldorf around the same time as Whittredge was another American artist William Morris Hunt. William Morris Hunt after attending Harvard College for three years left his studies shortly after his father had passed away. In 1844, he, along with his wealthy mother and three other brothers went to the south of France and later moved to Paris so that they could get a European education. This was followed by his attending the Kunstakademie Düsseldorf in 1845. No doubt at this time William M. Hunt came into contact with Whittredge who was still studying there. Dissatisfied, William Morris Hunt left the Düsseldorf Academy at the end of his first year of studies. During this time W.M. Hunt subsequently fell under the influence of Jean-François Millet [French, 1814-1875]. This resulted in him moving to the Barbizon to continue his studies with Millet. William Morris Hunt returned to the USA in 1854, presumably to Vermont where his roots were. Two years later he settled in Newport, Rhode Island where he taught art and in 1862 settled permanently in Boston. He continued to teach in Boston. He taught not just painting, but also lithography as well. He was a life-long proponent of art and artists from the Barbizon School and Millet’s work in particular. He was a collector of Millet’s paintings and sadly a number of them were destroyed in a fire that burned his Boston studio to the ground. He died off the coast of New Hampshire. There is some speculation that this may have been a result of suicide. Nathan Flint Baker was born in Cincinnati. He started working in clay around 1840. His family sent him to Italy with letters of introduction, two years later in 1842. He was to study with the neo-classical sculptor Hiram Powers [1805-1873] in Florence and other sculptors in Rome. He stayed in Italy until about 1846 when he returned to Cincinnati. He produced a sculpture of John James Audubon [1785-1851] which he exhibited at the National Academy in NYC in 1847. In the same year, he also produced a major eight foot high marble sculpture of Cincinnatus for the Cincinnati City Hall. This work became the object of neglect and vandalism and was subsequently moved to storage. It was rediscovered in 1928, but its present location is believed to still be unknown. In 1845, the German artist, Emanuel Leutze painted a portrait of Nathan Flint Baker. This work is in the collection of the Cincinnati Art Museum. Nathan Flint Baker returned to Italy and there appears to be two different versions of this story; 1.) he was previously living in Italy; or 2.) he planned to meet up with a family friend in Italy to travel to the Middle East. Either way, it doesn’t matter, he was known to be in Rome during the Spring of 1851. He spent the next two years travelling with his family friend throughout Europe and the Middle East. During this two year period he was one of the early photographers of the Middle East, including places such as Greece, Egypt, Turkey, Lebanon, Jordan and the Holy Land. These photographs are very important and very rare. Most are in institutional collections such as the Library of Congress. After this trip he returned to Cincinnati. It is noted that a local newspaper, as quoted in the Artists in Ohio, 1787-1900 book, stated that in July 1853 that “he had washed his hands of art altogether, having, he declares, almost forgotten how to hold a chisel.” Outside of a few trips to Italy, (one trip being between 1859 and 1861) he lived out the remainder of his life in Cincinnati. He did produce some work, but his production was significantly reduced. William Morris Hunt had a younger brother Leavitt Hunt. Like William Morris Hunt he also went to the south of France with his mother in 1844 and received a European education. Leavitt was a scholar. He attended Harvard Latin School, then attended a Swiss boarding school, followed by earning a law degree from the University of Heidelberg in Germany and military training in Switzerland. He later in his life returned to Harvard University and received a second law degree. In 1851, he met up with a family friend in Italy. The family friend was Nathan Flint Baker. Together they travelled in Europe and like Baker is considered to be one of the early photographers of the Middle East, including places such as Greece, Egypt, Turkey, Lebanon, Jordan and the Holy Land. Generally the two of them are considered to be the first American photographers of the Middle East. Only a handful of Hunt’s and Baker’s prints have appeared on the market, and they are amongst the rarest and most desirable early American paper print photographs. Most of his photographic images are held in institutional collections, primarily the George Eastman House, the American Architectural Foundation and the Library of Congress. He is known for his early views of the Middle East, including the first known photographic image of a Middle Eastern woman. After his “grand tour” with Baker it seems that neither one of them showed any interest in the photographic medium. He returned to the United States and began his legal practice in New York City. He practiced law in New York until the Civil War broke out, when he enlisted as a lieutenant in a New York regiment; he served on General Heinzelman’s staff, and was brevetted to the rank of Lieutenant-Colonel for gallantry in the Battle of Mulvern Hill. Invalided out of service in 1862, he returned to his law practice in New York, but retired to Weatherfield, Vermont in 1867, after his wife inherited her father’s estate there. Hunt spent the remainder of his life as a gentleman farmer, living in a house filled with exotic souvenirs of his travels. His father-in-law William Jarvis [1770-1859] was a diplomat, financier and merchant who imported Merino sheep from Spain. After moving to the inherited farm he purchased another nearby farm where he became particularly interested in rare breeds of Dutch cattle and propagating white pine forests. He did however maintain a life-long interest in art and wrote poetry. He also was an inventor with a number of patents to his name. Russell Morris Hunt has already made an appearance in this tale I write. He was the third brother to William Morris Hunt. He was an architect and like his brothers received a European training. He plays a very minor but interesting supporting role in this story. This is outside of his role as the architect of the 10th Street Studio Building in NYC where Worthington Whittredge had a studio. Having said that, he did have another role to play which was to accompany both his brother Leavitt Hunt and Nathan Flint Baker on their trip down the Nile in 1853. On this trip, like some other architects he produced artwork. These were included in an exhibition held at the Octagon Museum in Washington, DC in 1999. These works were included with the photos Leavitt Hunt and Nathan Flint Baker had taken in 1853. We can see that Worthington Whittredge was definitely aware of the four sons of Jonathan Hunt [1787-1832]. It is quite possible that he knew them all. Three of the four from this prominent Vermont family are listed above. The fourth was a medical doctor who lived in Paris. . I must admit that I am overly familiar with many of these artists, outside of reputation, names and a general awareness. They are outside of my usual scope of dealing in Canadian art. How close were they to each other? Maybe they were, maybe they weren’t. 1.) Is this an original subject matter for the print; or 2.) is it a print produced after a known painting by Whittredge; and 3.) regardless of which of the two options above is true, what significance did L. Hunt have as part of the process? All five main individuals (Whittredge, three of the four Hunt brothers, and Baker) must have crossed paths with each other at some point. We can assume that all five primary individuals probably had some dealings with each other in some capacity, somewhere along the way. As is always the case, some will be closer than others. Did Whittredge and Baker know each other in Cincinnati? It would seem possible that Whittredge and Baker may have crossed paths in Düsseldorf when Leutze painted Baker in 1845. It is also quite possible that Leutze may have painted the portrait in Italy during 1845 instead. Either way, it would seem likely that each other’s name would have come up in conversation. Did they actually meet in that year? Did all five of these main individuals meet in Rome during 1851 at the beginning of the Middle Eastern photographic or at the end of the photographic tour in 1853? Given how close the Netherlands is to Düsseldorf, did Whittredge produce any work in Holland? Is this a Dutch scene? We know from publicly available artworks that Whittredge painted a number of images of the Newport, Rhode Island area. Were these produced during the two year period that William Morris Hunt lived there. If so, did they cross paths with each other there? Given that Leavitt Hunt raised Dutch cattle, and being a gentleman farmer, did he try to re-create a Dutch farm on his property? We know that Leavitt’s father-in-law imported Merino sheep. Is it possible that this print was based on a painting of the father-in-law’s property? How close were Whittredge and William Morris Hunt to each other? Did one of the Hunt brothers collect Whittredge’s paintings? There are so many questions involved with this work. These are just a small sampling of some that come to mind as a result of what I have written above. 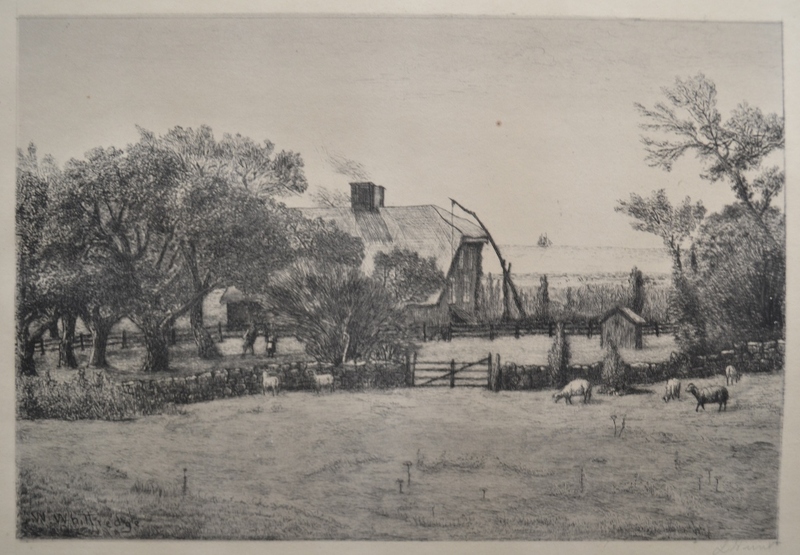 We know that William Morris Hunt taught lithography. We also know that Leavitt Hunt must have been a tinkerer because of the patents he held for inventions of farm equipment. Was the L. Hunt in this print Leavitt Hunt? Making an assumption that it is possible yes, did William Morris Hunt teach his little brother Leavitt how to produce a lithograph? If so did he use one of Worthington Whittridge’s paintings (possibly of his farm or a work he owned) as subject? I then remembered that a few weeks (maybe a month) ago there was a story in Fast Forward that talked about the Tiny Gallery. It is a stand-alone art space that occupies the small courtyard beside the store. You can see the “gallery” in the picture above. It is the tall wooden structure to the left of the sign. The small exhibition space is inside the Plexiglas box at eye level. It is a great concept. Bring art to the average person, in surprising, but accessible places or spaces. The gallery is viewable 24 hours a day. I stopped to take a look at the new show. This is the third show for the Tiny Gallery. Each of the three shows the gallery has hosted, featured a different member of the three-member (and briefly for about a year or two, a four-member) artist collective, Bee Kingdom. This time the artist featured is Philip Bandura. This show is somewhat timely. During the past few months there has been much press dedicated to the Sochi Olympics and LGBT issues in Russia. Much of the timeliness of this controversy has already worn off, as the 2014 Winter Olympics has ended. In this context, the work of Philip Bandura continues that discussion in this small exhibition. 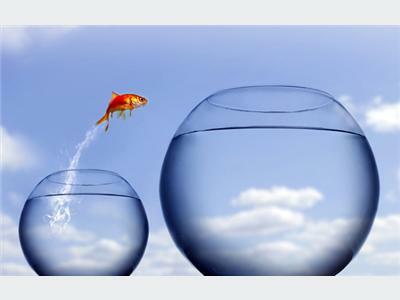 Freedomco is a vehicle that Philip Bandura has used over the past few years in his own work. 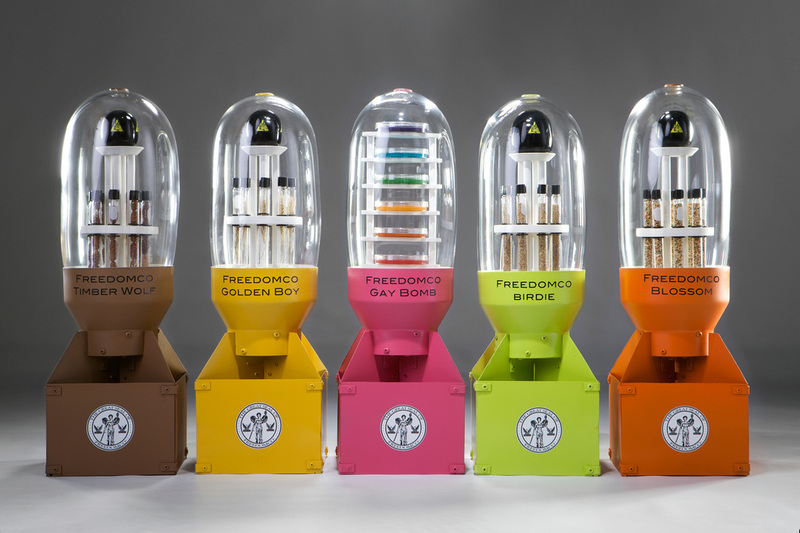 Briefly Freedomco often deals with LGBT issues in an art context. Freedomco is a fictitious company that I created to parody promotions of “freedom” and “security” in a variety of ways. As such, the work often deals with how I interpret my experiences as a gay man in contemporary western culture. It is my intention that these works are seen as humorous and that humor will act as a vehicle to address the seriousness of the underlying content. The fundamental goal is to facilitate dialog between queer and straight communities alike. “Gay be Gone Russian Gold” was created in response to the recent anti-gay laws in Russia. The tonic would fulfil the dream of the Russian government of “curing” being gay. 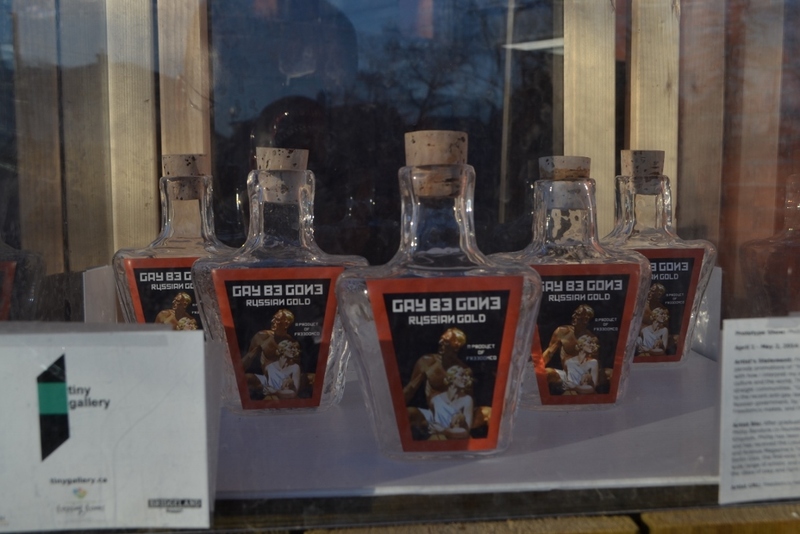 It is one of a number of tonics Freedomco makes, and the second in the Gay be Gone series. These works often contain an installation-based product (for lack of a better word) and is often conceptually-based. Periodically there is a performative element relating to the work. Whether that is necessary can be debated, but it does serve to give context, especially for those who are not immersed in the art community who attend the show. So I get it. In a previous exhibition that I attended a couple years ago Philip exhibited a large work that he created entitled A Better Way to Bomb, 2011. I had a photo of it on a memory card inserted into a camera that someone felt that they needed more than I. As a result I have to use a photo from the Bee Kingdom. It was quite an interesting piece and it is part of the roots where this work in the Tiny Gallery comes from. You can see more from Freedomco here. The piece above played off a proposed harebrained idea by the US Military to create a “gay bomb.” It is actually rather humorous. If one feels inclined, you can read more about this project here. This piece in the Tiny Gallery continues that discussion. Here bottles are used. I would assume that they potentially could be Russian liqueur or vodka bottles. This small venue is a fantastic place to exhibit this work as it does create an interesting dialogue with average people on the street. The space lends itself well to small sculptural work and glass. I would assume with the hot afternoon sun during the summer, the temperature inside the Plexiglas box could probably get quite high. As a result it would not be conducive to works on paper, encaustic or those works containing fugitive colours and paints. It is nice to see these type of alternative spaces being used for art exhibitions. I also applaud the people behind Tiny Gallery for being willing to engage in potentially challenging subject matter. Earlier today I set up a new wordpress site. This site is tied in to a new project that I am working on called Galerie Sans Nom YYC. It is a pop-up gallery with the express purpose to tie up loose ends, dangling issues and help me and the artists that I have represented in the past move on with our lives – wherever that may lead. Quite frankly this is about doing the right thing. It is also long overdue and needs to be done. I am terrified. I really cannot afford to do this. This might very well be the craziest thing I have ever done. It might also be the bravest thing as well. There are so many things that can go wrong. I don’t even have a lease in place. All I have is a loose commitment that I will have a space conditional upon meeting a few requirements. I don’t even have full access to my inventory. I don’t even know if I will be able to get access or when. All that I know is that I am doing this on faith alone. That is all I have to work with. Regardless of this – it has to be done. And it needs to be done now. My boss knows nothing about this. I am worried that I will lose my job when I ask for a leave of absence on Tuesday and hopefully open the doors that same day or the day after. All I ask is that the reader send best wishes into the universe on my behalf, as I embark upon this voyage into the unknown.